To make a successful business plan with a printing press or any kind of business like print on demand business. People often feel the essence to have a well featured and qualified Website. 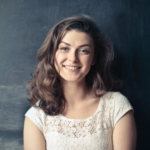 Where they can showcase their work as a portfolio and get their customer attention. This post is especially for printing press shop. And Who wants to start their print on demand WordPress business website today. This article can be a great solution for you. We listed here some most popular authentic and premium quality printing press WordPress theme. Before choosing your desired theme lets to have some idea about the facts you need to know before buying any of them. In the web world, you can get thousands of WordPress themes. But do you think all are same and you can grab any of them? No, not at all, every single theme provides you with a different type of customization feel. You can either grab any of theme but may not be benefited as well. So you have to research and choose the best one for you. As it is about a printing press WordPress theme, you have to look over some basic important factors and I am trying to give some information about those facts. The SEO friendly theme will let your theme catch the visitors attention and maintain the rankings of it. Woocommerce print on demand capability of the theme will let you sell your products through the online market. So you can check out about these facts. Besides SEO optimization and WooCommerce support, you should check about the responsiveness, cross browsers capabilities, whether it is retina, RTL and child theme ready or not etc. You should also check it out whether or not you can edit and customize your theme with enough support like google fonts, color options, and layouts etc. This fact is very important because it won’t be pleasant if you can’t customize your theme as you want to. Lastly, I will ask you to inquire about the features you really love to have like the commenting system, admin panel etc. As it is a printing press WordPress theme and it is related with your business factor, you may have some special demands and so you are the one who should confirm those features. So I hope you are enough aware of which functions you need and you will choose your theme in accordance with your demands. Then let’s check out the features below 20 amazing printing press WordPress theme. I am quite optimistic that you will get your desirable one. 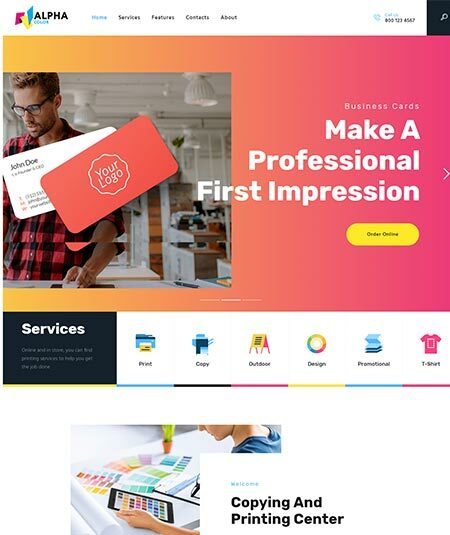 Let’s meet a world class, fresh, colorful and iconic printing service WordPress theme, AlphaCore. You can give a try on AlphaCore if you are interested in printing press theme. AlphaCore is very suitable for the printing press organizations with its dynamic typography and features. As it is SEO optimized, the visitors will get it easy to find your site. WooCommerce compatibility of AlphaCore will be extra support for you. Because with this service, you can be benefited by selling your products through the online markets. Grab this theme if you are planning print on demand woocommerce service on your site. You can also share the posts of the site through various social media as it is cross browsers compatible with the social media icons. For AlphaCore’s excellent and dynamic features and facilities, it should have a strong recommendation. Are you looking for an elegant printing service and copypress type WordPress theme? If so, CopyPress is here for you. This theme is a good fit for printing, copying, 3d printing agency, typographies, graphics design etc. CopyPress is an SEO optimized theme. For this great feature, you don’t have to worry about the rankings of your page. Again this page is built with the drag and drop page builders. You will offer a 100% responsive and mobile friendly WordPress theme by CopyPress. So you can use this theme even with your smartphone. As it is cross browsers compatible with lots of social media icons, you can share your post through those media too. Again this theme is retina and RLT ready. So I am quite sure that CopyPress will meet all your needs. 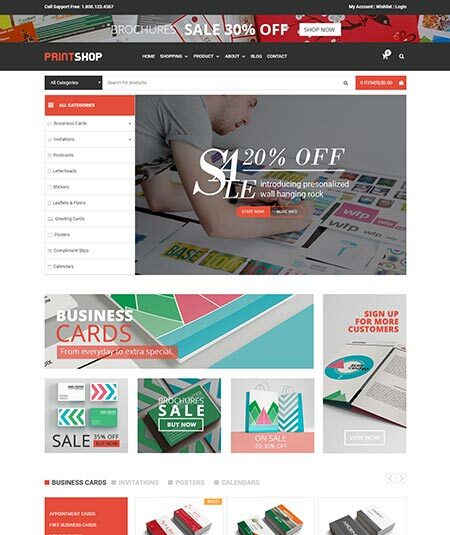 If you are willing to have your own printing WordPress theme, then let’s meet a dynamic and responsive theme, Printshop. In fact, Printshop is a very good small and medium printing business. Printshop has powerful design tools that will help you to customize multiple printing projects. This theme page is very homely and easy to use, customize, install and update. This theme is fully responsive and mobile friendly. It is again built with SiteOrigin page builder. Furthermore, with Printshop, you can print anything you want on your page or clothing. To sell your products through the online shop, you will the facilities of WooCommerce. With more than 10 extensions, you will get outstanding revolution sliders. I am pretty sure that Printshop will be able to meet all your demands. Let’s get introduced with a newly launched colorful and iconic printing service WordPress theme, ColorLab. So have a glance at it’s special and exclusive features. 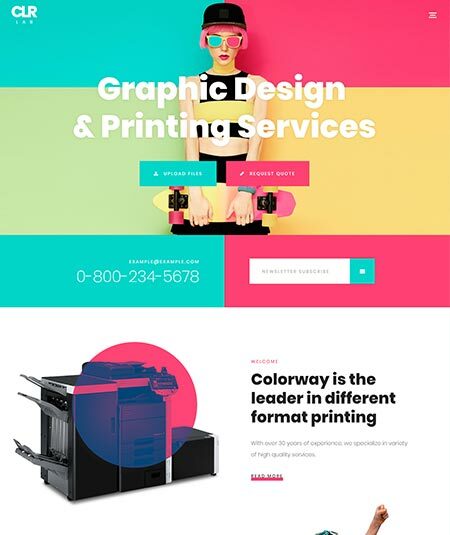 ColorLab is a perfect WordPress theme for printing service, typography service, photocopying service, and the others. You can also use for web design studio, color copy center etc. WooCommerce compatibility is available in ColorLab so that you can sell your products through online. You can also customize the theme very easily with the help of PSD files. Several pre-designed color chimps and 5-star support will be the benefit for you if you are with ColorLab. Again, you will get enough fonts, icons color classification etc for free. So I think there should be no problem with ColorLab. To have a multiple printing service WordPress themes, you can give a try on Fi-Print. It is, in fact, a modern, responsive and multiple corporate WordPress themes. 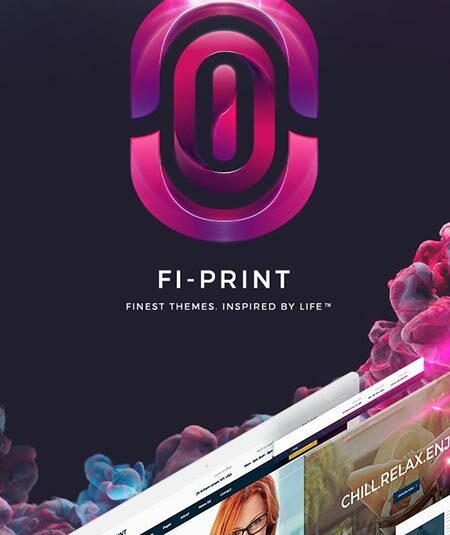 Fi-Print is probably the only theme that will offer you two brand new demos with new features for every month. This page is built with the drag and drop page builders. While using this theme, you don’t need to buy any extra plugins because almost all of them are available here. You will also use it without any code requirement. Fi-Print is an SEO optimized and so about the rankings of your theme page, you don’t need to think at all. This theme is also cross browsers compatible. So what are you thinking about Fi-Print? I think it is worth to appreciate. 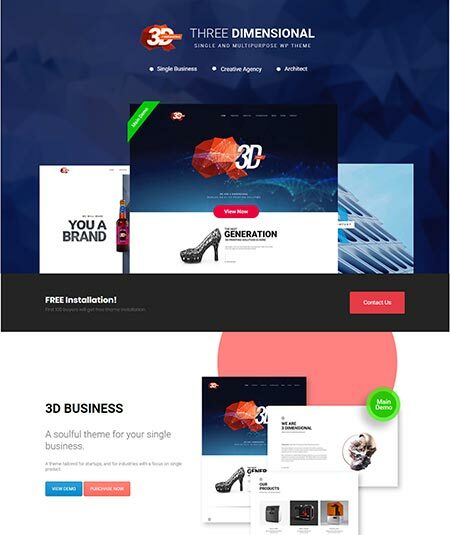 ThreeD is a renowned and premium WordPress theme for architects, studios, agencies, and creativities. Even you can use this theme to showcase your portfolio and works. It is an exclusive WordPress theme with clean and modern UI design. This theme is customized with visual composers and sliders revolution. ThreeD is a theme with WooCommerce capability and so you can easily sell your products through this theme. You will also have organized documentation and mailchimp. This page is built with the drag and drop page builders and it is widget and child theme ready. To get any help and support, you are allowed to contact their always active customer service. I am wishing you the best of your luck in advanced with ThreeD. Are you willing to have your own web print store? If so, Porto-Novo is for you. It is actually a clean, modern and responsive printing press WordPress theme. Porto-Novo is such a useful theme in that it allows you to sell your products through the online markets as it is WooCommerce compatible. As this page is built for speed, you will experience its ultra-fast loading system. Multiple menu styles will also come as a great help to you. You can use this theme for printing mug, t-shirt, phone case, and many other items. It is also fully responsive and mobile friendly so with your smartphone, you can operate this theme smoothly. For Porto-Novo’s following excellent features, it must have a recommendation. Helium is the name of a WordPress theme that is built especially for creative people and bloggers. Let’s check the features of Helium whether or not you are actually looking for it. SEO optimization services are available in Helium so that your theme will always catch the visitor’s attention. In this theme, one click demo content is also available. Helium is a fully responsive theme and you can use it even with your smartphone. Even this theme have the license of RoyalSlider, Isotope, and GSAP. Again this stunning theme is with tabs of shortcodes, blog post formats, and three portfolio layouts. Lots of other superb facilities of Helium are ready to blow your mind. So you don’t think a lot to have Helium because it is worth to get an appreciation. 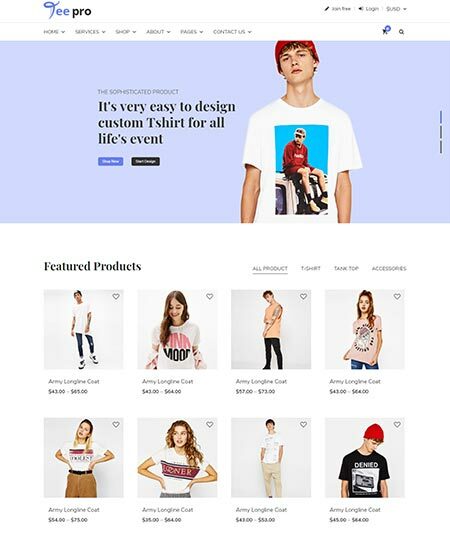 Are you looking for a t-shirt designing WordPress theme? 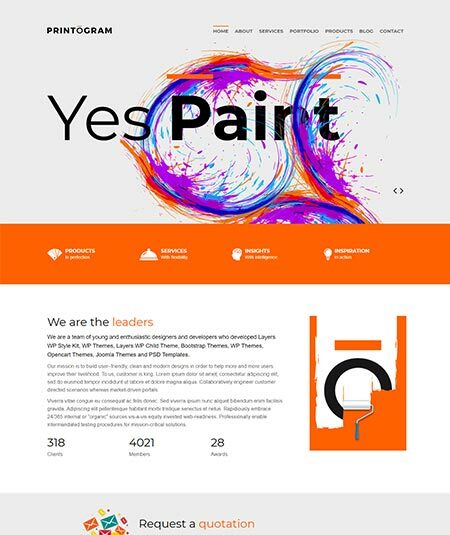 If yes, you can have a glance on this WordPress theme, Teepro. It is, in fact, a responsive and authentic t-shirt design WordPress theme. It doesn’t matter if you are an expert or a beginner to use Teepro because it has demo features and many prebuilt icons. It is also very easy to use and customize. Teepro is SEO friendly and so it will always ensure you about your theme ranking. It is also fully responsive with WooCommerce capability and so you can easily get profit by selling your products. With tons of color options and Google fonts, you will get it very easy to customize your theme. So I hope Teepro is enough qualified to meet almost all your demands. 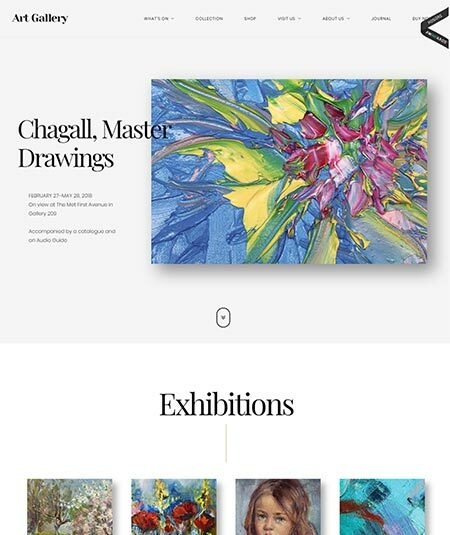 If your interest is now on a WordPress theme for art galleries, I will then introduce you to Arte, a premium WordPress theme, especially for art galleries. It is again very good to use for printing, sculpture, photography, drawing etc. Arte is built for a perfect website with the visual composer, slider revolution and event schedule. This theme also includes the online documentation and class management system. Are you an expert? If no, you don’t need to be worried because Arte is organized in such a way that everyone even the beginner can operate it easily. Again Arte is fully responsive and mobile friendly. Arte is optimized for speed with the SEO friendly code. So you don’t have to think about the number of the visitors. Furthermore, it has social sharing integration with revolutionary sliders. What else you need? I think it is enough to satisfy your needs. 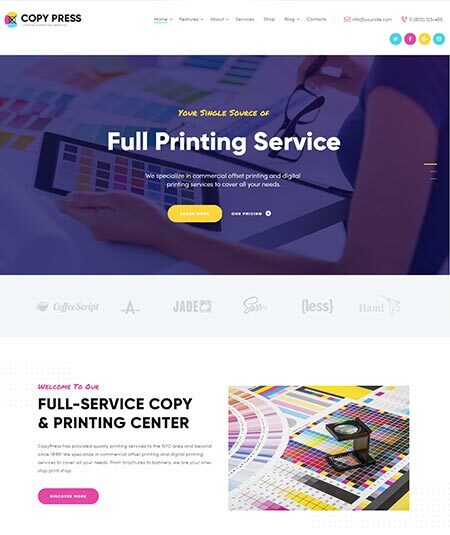 If you are looking for a good WordPress theme for a printing house, company, printing press business etc, Printogram is here for you. So its time to check its features and facilities. 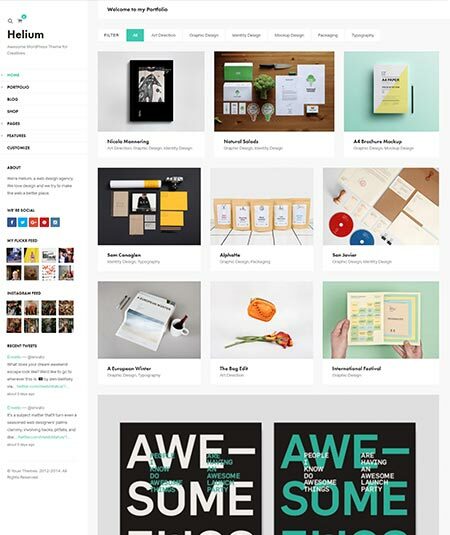 Printogram is a very flexible and fully responsive WordPress theme. Again it has impressive features like Google map, king composer page builders and full-screen header. Cross browsers capabilities of this theme will always help you to operate this theme with different browsers like Firefox, Safari, Opera, Chrome etc. To customize and edit your theme page without any hassle, you can use tons of Google fonts, layouts, color classification, and sidebars. So all the features are quite good to make Printogram as one of your great company of the journey of your success. Hello kitchen lovers! Are you looking for your own recipe and food-related WordPress theme? The kitchen Table is then waiting for you. It is, in fact, a very simple and easy recipe theme for WordPress. This dynamic WordPress theme is responsive and mobile friendly. So your visitors can cook while operating your theme with their smartphone. This theme has a sticky menu and user bookmarking system too. 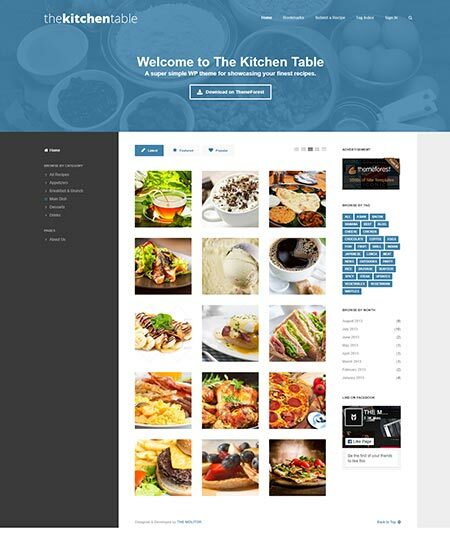 The Kitchen Table includes more than 300 Fonts Awesome icons with demo content XML. With its unlimited color options, you can customize it as you want to. This amazing recipe theme page is retina and translation ready with advanced jQuery animations and effects. Tag index page temple and WP menu and widgets are also available here. So if you have your needs matching with this theme, don’t late, just grab it quickly. If you are looking for a responsive and fresh photo company and photo supply WordPress theme, then let’s meet PhotoLab. In fact, PhotoLab is a refined and alluring photography related WordPress theme. 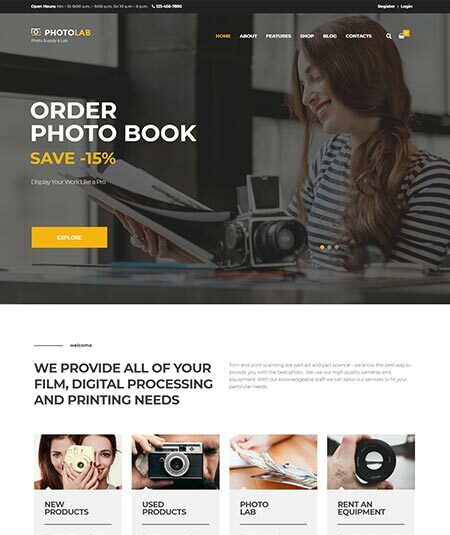 PhotoLab is a fully responsive and WooCommerce compatible theme. So you can sell the photos and other products through the online markets. It is also mobile friendly. Furthermore, PhotoLab is SEO optimized. You probably know what does this fact do. Yes, it will keep watching on the theme’s rankings. It has also translation options and revolution and swiper slider. Then what do you think about this PhotoLab? Do you think it has any quality problem or lackings? No, I think not at all. But once again think about it and if it is good for you, then why late? If you are in need of a responsive retina ready WordPress theme with grid system layout, you can give a try on Bleecker. I think you don’t need to worry about its features but still please give a look at its features. Bleecker is compatible with cross browsers capabilities and so it can be operated by any of the browsers like Firefox, Chrome, Safari, Opera etc. You can also share your post through the social media as it includes social media icons. The websites, Bleecker includes are home, portfolio, about, Blog and contact. This theme has also both single page and multiple pages. So these will be a great help to you. Bleecker is built with HTML and CSSS3 code. Again it has many other functions that you will love the most. All its features will help you to have great experience in this web world. Best of luck. 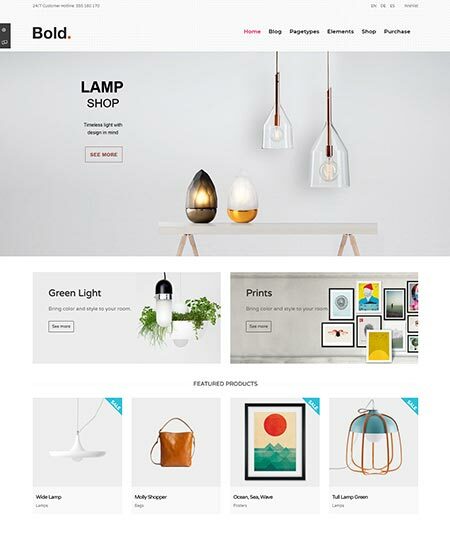 Replete is the name of a very responsive and authentic WordPress theme, especially for e-commerce and business concept. This theme is good enough to sell clothes, print, and songs etc. to impress you. SEO optimization is a great benefactor of a theme that helps you to catch the visitors’ attention for your theme. Replete is also SEO optimized with 13 predefined skins. The WooCommerce support for this theme will let you sell your products through online marketing. So this will come as a great benefit as you can build any kind of online shop. Replete is also translation and WPML plugin ready. Its responsive design will also mesmerize you. However, this theme will be a great company on your journey to be successful. So don’t late to grab this trusted companion. Yes, it is Bold, a bold and responsive premium quality WordPress theme for e-commerce and business concepts. Let’s check out the features of this amazing theme. Bold is with the sticky menu, revolution sliders, and visual composer. Extensive theme options panel is here and it helps to change the appearance of your theme with no coding. With the WooCommerce support, you can be benefited by selling your products through the online markets. For money transference, you can use multiple payment options like PayPal, Direct Bank Transfer, check payment etc. More than 60 Google fonts and unlimited color options so that you can customize your theme with your sweet will. It has also RTL support and it is multilingual ready. So it features must satisfy your needs. Extinct is a renowned retro vintage portfolio WordPress theme. 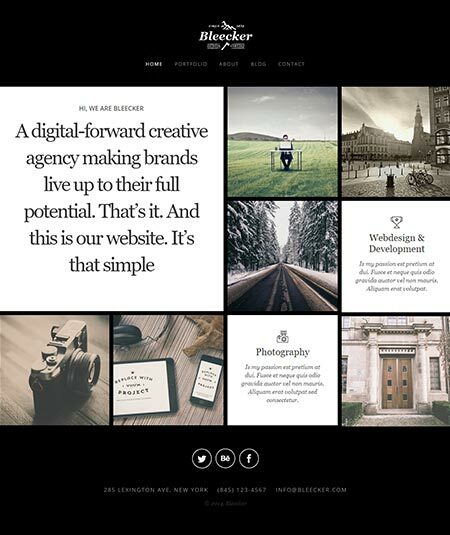 Extinct is a refined handcrafted theme especially good for creative agency and business. If you think you are looking for such theme, let’s meet Extinct’s stunning features. This superb theme page is built with the siteorigin page builders along with the HTML and CSSS3 code. Its responsive design will always blow your mind. Extinct is customized with the unique appealing system also with 500 retina icons and 200 options to customize the theme. Again unlimited color options will also help you to edit the theme as you want to. The perfectly layered PSD files and power admin options will also come as a great help to you. To know about its other features you can browse on it. I hope you won’t be disappointed with this great theme. 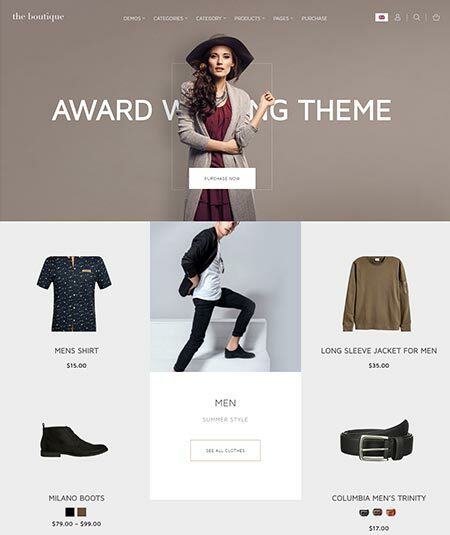 If your attention is now on a fashion and shopping related wordpress theme, Floris can be a great option for you. 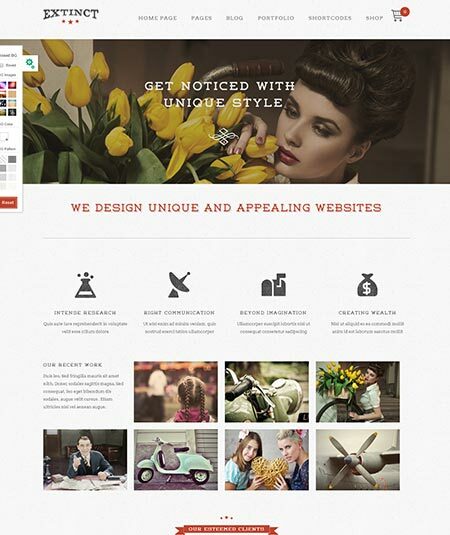 Floris is actually an e-commercial web theme page about many aspects of fashion and lifestyle. To be benefited by selling online products, you will need a WooCommerce supported theme and Floris is like that. Again it is a multi-currency switcher plugin supported the theme. Floris is fundamentally an SEO optimized theme. This is the reason for your security about your page ranking. Furthermore, Floris is compatible with almost all the cross browsers. You can customize your theme just like your sweet will with its unlimited color option and fonts. So what is your opinion about Floris? I think it is worth to be recommended. For the businessmen, who are willing to have their own WordPress theme on the multi-business concept, Metro-Blocks is for them. It is a fully responsive WordPress theme, launched by Zurb Foundation. Metro-Blocks is an SEO friendly WordPress theme. So don’t worry about your page rankings. It is built with the Zurb foundation and premium plugins. Metro-Blocks is again cross browsers capable and with the essential social media icons. So why are you thinking further for it? Isn’t it good enough? If it is for you, don’t make it late to have this. Pearle comes with tons of stunning features of a multiple service WordPress theme. It is very suitable for the theme crafted service and shops. So let’s check it out in detail. It is a fully responsive and retina ready WordPress theme. As it is SEO optimized, you don’t think about the number of your visitors. It also includes revolution slideshow and translation system. Unlimited color options and fonts are also available so that you can customize your theme by yourself. 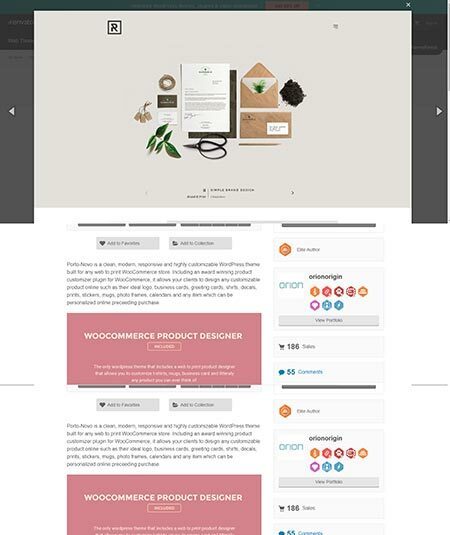 The WooCommerce compatibility of this theme will also help you selling online products. Mega menu and live theme customizers are also available for this theme. What we see, almost all the necessary features are available in this theme. So you can make a great journey in the web world with this theme. Best of luck.